Donna Mc Callum, a.k.a. 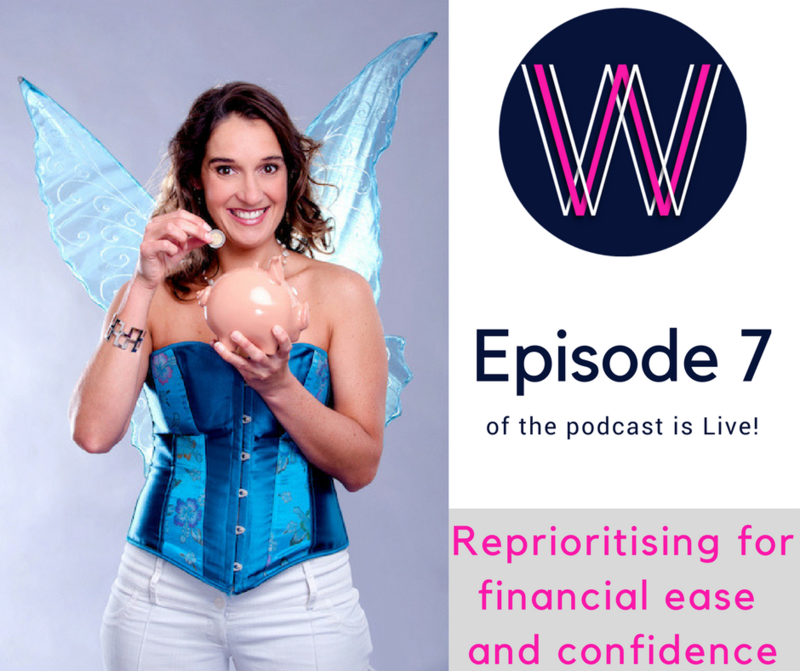 The Fairy Godmother, joins Lisa Linfield on this podcast to discuss creating financial ease and confidence. She has clients in 45 countries in the world, and over 10,000 who have done her courses. Recorded Voice: 00:00 Welcome to Working Women’s Wealth where we discuss what it takes to build real wealth in a way normal humans can understand. Here’s your host, Lisa Linfield. Lisa Linfield: 00:21 Hello everybody and welcome to Working Women’s Wealth. Today I’m joined by Donna McCallum who is a fantastic human being and to many of her followers is known as the “Fairy Godmother”. Welcome, Donna. Donna McCallum: 00:34 Aw, thank you, Lisa. It is so wonderful to be on your podcast today, making magic and sprinkling fairy dust. Lisa Linfield: 00:42 Absolutely. So, Donna, yours is an interesting and fascinating journey. You go to university and you study all this intellectual business science, honors degree and now you’re a fairy godmother. For those of our listeners who haven’t yet got to know you, how did you make this transition? Donna McCallum: 01:00 Wow. Yeah. So, as you said, I did an honors degree in finance at university and then I went out into the big, wide world and I let go of all that finance stuff and I went into advertising and marketing and I was involved in advertising and marketing for about 10 years. And I had a business that I was running and I sold it in 2005. And I had always had a big dream of going to South America and learning how to speak Spanish. It was a dream that just wouldn’t go away. So, from 22 until 28, 29, I had this dream. And when I sold my business I thought, “Well, okay. This is the perfect time to do it”. And so, off I went to South America to learn how to speak Spanish. And while I was there, about five months into my trip, I had this amazing, crazy, epiphany experience, is the only way I can describe it, where I discovered, on a night bus in Argentina, traveling through the night, that my purpose for my life was to be a fairy godmother. And, really, that my big purpose was to help people get clear on their dreams and goals and really help them understand the power of their dreams and goals to create extraordinary lives. And I was so inspired and so excited and so filled with possibility of this big vision that I had that I came back to South Africa and I started to tell all my friends and family that’s … I knew what I was going to do next. I was going to be a fairy godmother. And I’d been previously a very serious, marketing executive in my own marketing business and now I was going to be a fairy godmother. And they all thought that, that was very bizarre and crazy. And, so did I, think it was a bit crazy, but I was so inspired and so enthused. I had no idea, at the time, what it meant to be a fairy godmother, or how I would make it work, or how I would do it, or how I would make any money with it, but what I’ve learned over the last 12 years of being a fairy godmother is that, that’s how all big dreams and goals start. You start with this vision. You start with this crazy idea and you, at the beginning, often have no idea about how it’s going to work out. Lisa Linfield: 03:11 What did you think, at that stage, a fairy godmother was and what has it become for you? Donna McCallum: 03:18 So, at that stage, I knew I was going to help people with their dreams and goals and, at that time, I’d been an entrepreneur. I’d had four businesses, two of which had been very successful that I’d sold, and two of which had been complete failures, which I had closed. And so, I was just off the back of one of the successes and I thought, “Okay, well, maybe being a fairy godmother would look like helping entrepreneurs,” because that was a feeling that I had. I was in that line of entrepreneurship. And so, I started off by doing one-on-one coaching with individuals, with entrepreneurs, but very quickly it morphed into me starting to run workshops. And my workshops just took off really, really quickly. I started by running a dream mapping and goal setting workshop around South Africa and, within a year, I was doing those workshops in London, in Germany. And then, the following year, in the US. And I was like, “Wow”. And then, next thing I knew, I was asked by South Africa’s biggest publisher to write a book. And I was like, “Wow”. So, it was almost like the dream grabbed me by the scruff of the neck. As soon as I committed to it and really just said to everyone around me who thought I was crazy … I said to them, “Look, sure … I’m doing this thing”. It grabbed me by the scruff of the neck and just took me on this journey. And where that journey has led me to, 12 years later, is that I now teach in the area of dreams, goals, vision for your life and how to get clear on it and how to manifest it and make it happen. And then, I also teach in the area of self-worth and self-esteem and growing your self-confidence. And then, how to have more flow and ease in your life. So, that’s where it’s come on to and I now don’t only do … I do workshops and talks and seminars and retreats and also a number of online programs. And I’m just in super-gratitude and blessedness that I’ve got clients in 45 countries around the world. Thousands of people have done my courses and it’s just been the most magical journey. Lisa Linfield: 05:46 What has been your biggest learning, so far, in your own personal journey? Donna McCallum: 05:50 There’s so many. I don’t know if I can say what the biggest one is. If I reflect back on a 12-year journey like this, the biggest one is just, if you have a vision for your life, when you get clear on that vision for your life that touches, moves, and inspires the hell out of you, follow it. Just grab onto it and follow it with all your might, because it will create the most magical, inspired, amazing life for you. And if you have a big dream, you can do it. Even though there will be times where you will be filled with self-doubt, where you will be filled with fear, where you will have absolutely no idea how this thing is going to transpire and you will often feel like you have not got the resources to make it happen, but I promise you, if you just keep holding the vision, those resources come and amazing things happen. Life is very supportive of big dreams. Lisa Linfield: 06:45 So, how do you answer that person that does say, as you said, “But what about the money? I’ve got this amazing, huge goal, but what about the money?” I mean, clearly it’s a question that has been asked of you so many times that you did put together your course. What is your answer to them, “What about the money”? Donna McCallum: 07:03 Yeah. So, the first step is really about getting into great relationship with money. So, one of the reasons why people start to say, “What about the money?” is because they are often in quite negative relationship with money. And this is true for most of the people around the world. So, most people around the world, Lisa, and you’ll know this as a financial advisor, right? You will have experienced this. The financial education that we get growing up is almost next to zero. Have you experienced that? Lisa Linfield: 07:32 Absolutely, absolutely. This week I have taught 64 little six-year-olds about money, because I’m so passionate about the fact that the earlier they start learning about it, it’s the most important skillset that they need. Geometry was always a great one for us. I’m so glad I did geometry. I’ve used that a lot in my life. Since I did it, I’ve really used that. That’s been a very helpful tool set for me. Donna McCallum: 07:54 Yeah. And it’s been very helpful for you to know what cumulonimbus clouds are as well. Lisa Linfield: 07:57 Absolutely. Except that you can bounce on them, apparently. Donna McCallum: 08:02 So, yeah. It’s that kind of thing. So, at school we’re taught all this theoretical knowledge about knowledge stuff, but we were never taught about money. So, you’re not taught about money in school. You’re not taught about money at university and even though I did an honors in finance, it didn’t teach me about personal finance. It taught me very theoretical things about how financial markets work, but not personal … Not what I must do from Step A to Step B to reach my own financial freedom. And most people learn about money from their parents. And if you consider how your parents were with money, most people’s parents were in deep scarcity. And there was not enough to go around. And so, consequently, many people are now living with beliefs about money that they adopted when they were five, or six, or seven years old, and don’t actually want to even look at their money situation. And I find this time and time again with the thousands of people that have done my money magic program. In the first week, we really delve into, “What is your relationship with money like?” And the big “Aha” moment for many people is … And I always say, “Imagine money was a person,” right? So, actually personify money. So, can you bring that up in your head, Lisa? What money would look like? Donna McCallum: 09:28 So, some gorgeous guy or some lovely lady. That’s money, right? And this is a relationship you’re going to have for your whole life. And this is one of the interesting things for me, always, is that most relationships in our life come and go, right? Even your husband or your wife. That relationship will end at some stage. But there are only two relationships in our lives that last our whole life. And these are the ones we spend the least time on, actually. And those two relationships are … The first is the relationship that you have with yourself. And the second is the relationship that you have with money. And, as a fairy godmother, these are the two areas that I really concentrate my teaching on, because I believe, if you get those two right, the relationship that you have with yourself and the relationship that you have with money, you’re living an incredible life. Lisa Linfield: 10:16 So, if we come with a view that many people are brought up in scarcity, which they are, how does this culture of spending, and spending, and spending and buying fancy things … ? Where does that come from? Donna McCallum: 10:29 Marketing and the banks. Very simple. And it’s generational, right? So, the culture of spending … I look at my parents. My parents were quite old when they had me. My Mom was 38 and my father was 52. They had very firm beliefs about money. My father’s big belief about money was, if you didn’t have the cash, don’t buy it. And he ground that into me. But he was two generations above me, not one generation above me. So, that wartime generation, that most of our grandparents are in, they would save up. If they needed the fridge, they would save up for the fridge. If they needed the car, they would save up for the car. And there also wasn’t the credit available. But then, in the ’80s and particularly in the ’90s, the amount of credits that became available shot up and through the roof. Plus, the ability for technology to manage credit scores and the ability for technology to manage card payments and keeping tabs on what people were paying where. Suddenly this proliferation of access to credits and access to be able to just buy. And then a lot of the companies making more money off their debtor’s book than making money off whatever it is that they were selling. So, I mean, I remember in the ’90s hearing the story about Edgars really making more money off the interest that it was charging to its customers than off the actual clothes itself. And so, suddenly these retailers found themselves in a very different business. And now they were offering, left, right, and center, “Have a card”. “Get this free”. “Get this now”. And we went into this instant gratification culture. Along with all of this technology shifting, we went into instant gratification. Wow. A meal that used to take two hours, 50 years ago to make, now takes 30 seconds if I pop it in a microwave. And so, we live in what I feel is a microwave culture. And so, people want things and want it now. And they’ve got a card to be able to do that. Lisa Linfield: 12:40 So, when you’re working with people in your Money Magic course, how do you get them to change their mindset around this consumption culture when it’s the way that everybody is, that they are, and … ? “But you don’t understand. Everybody’s got a fancy new phone”. How do you get them to change their mindset? How do you go from being a member of a consumer society to stopping and actually just saying, “Hey, I don’t have that money for the fridge, so I won’t buy it”. Donna McCallum: 13:13 Yeah. So, that’s a great, great question. Have you ever had debt, Lisa? Lisa Linfield: 13:19 Not really short-term debt. I have, in terms of mortgages and home loan, but when I was very young I had credit card debt when I first moved to England to start up my life in England, but I paid that off quite quickly. Donna McCallum: 13:37 Do you remember what that credit card debt felt like when you had it to start your life in England? Do you remember what it felt like? Lisa Linfield: 13:43 Oh, it was terrible. I mean, I remember one of my fundamental pivotal moments before going to England was … within my first job. And, of course, my first month of living by myself, not with parental support, and I got to the end of the month and I couldn’t afford to buy essential toiletries. And I had to go and ask my Mom if I could borrow some of her essential toiletries. It was the most humiliating moment of my entire life and I swore I would never, ever, ever get into that space again. Donna McCallum: 14:17 Yeah. And so, if you have had any consumer debt … And I’m not talking about mortgage debt, but I’m talking about consumer debt, particularly. You will know the absolute terrible, heavy, negative feeling that comes with that. And that is one of the biggest ways to shift people out of that, because people hate feeling that way, but they get stuck in the spiral of it. So, they really jump into the spiral without even thinking about it. And the consumerist culture just lures them in, is my way of seeing it. And then, once they’re in it, they’re in it. And then this horrible, horrible feeling kicks in. And the truth is, all of them say, “Absolutely”. And then I say, “All right. Here are the new habits to create to get that to be gone”. So, it’s really about bringing people into the awareness of the emotional and the psychological and the actual physical feeling of that debt and what it’s doing to them. The other thing is to show people how they can reprioritize their spending so that they’re not giving up everything, but they’re just doing it in a way where they’re putting themselves and their financial security, and ultimately financial freedom first, versus having this new makeup. And I have a beautiful story about one of my recent Money Magicers, okay? She was on my Money Magic program and she posted this on our Facebook support group, because we have a private Facebook group. And she said, every month at work, this woman used to come around selling makeup. And every month she would then go and buy this eyeliner this month and next month would be an eye shadow and … etc. And this month, because she’d done my Money Magic, when the makeup woman came around, she said to the makeup woman, “No, I’m not buying anything this month”. And the makeup woman was like, “What do you mean? You buy something every month. Come on, you need makeup”. That whole consumerist thing, right? And [Kat 00:16:43] ended up saying to her … And I love this and this is one of the things that I teach people is, “My money has other priorities right now”. Lisa Linfield: 16:52 I love that. Donna McCallum: 16:52 And it’s really about prioritizing your feeling of financial confidence, your feeling of financial ease. Can you imagine how it would be to feel ease and confidence around your money? If you’re listening to this now and you’re in debt, can you imagine the opposite of feeling that heaviness, into feeling ease and confidence? It’s amazing. It is miraculous. And let me tell you, it shifts your whole life. And so, yeah, it’s really about reprioritizing. It’s not about sacrifice. It’s not about going without. That’s scarcity thinking and I don’t teach that. I teach abundance thinking, but I teach reprioritizing what you’re really wanting to create in your life. Lisa Linfield: 17:32 I totally agree with you. I had a group of helpers as part of one of my philanthropy initiatives. We did a course called Helping Helpers and the helpers … We were discussing this issue of debt, because it was their number one issue and we were talking about it and I said, “Why do you feel that need to buy that new cell phone?” And the answer was, “Because when I see other helpers that have fancy cell phones, I think that I should be able to have that”. There’s so many of our behaviors are to impress inadvertive commerce people out there, but the reality is that people close to us who love us don’t care whether we’ve got a fancy cell phone or not. They love us for who we are. But yet, there are so many of our consumeristic behaviors that firstly, we feel is almost condoned by others, because they have it, therefore we can have it. But their circumstances are completely different to ours. They have completely different financial circumstances and none of us ever know what’s going on behind closed doors, in terms of the financial circumstances. So, if I hear you correctly, you start with saying to them, “You need a really strong vision of where you need to be. And then you need to really understand what your relationship with money is”. I mean, very few of us think consciously about what your relationship with money is. As you said to me, “Visualize money as a person”. My first question is, is money male or female in my mind? Because a person is male or female and then how does one find out what your relationship with money is? Donna McCallum: 19:35 Yeah. So, I mean, you very, very easily … So, you imagine money as a person and then you just answer this question. There are two questions that I ask people to answer, just as a very brief exercise to be able to do, and if you’re listening to this podcast now, you can do this. And you just write down, “My relationship with money is … ” And now fill in whatever comes to mind first and just allow yourself to say what it is. “If money was a person, my relationship with money is … ” And what is it currently? And the next question is, “If money was in an intimate relationship with me, it would … ” And what I normally find, Lisa, when people answer this question is that people are suddenly realizing … They get this massive “Aha” moment. My relationship with money is, “distance” or, “disrespectful” or, “abusive” or, “unfulfilled” or … And if money was in an intimate relationship with me, “it would want a divorce”. Or, “it would keep leaving me, because I don’t treat it well”. Or, “I’ve got no idea what money likes,” etc. And so, when people have this realization, they start to see why money is leaving them, because everything is energy. You are energy. I am energy. This podcast, the sound waves going through to whoever’s listening, is energy. The car that you’re driving is energy. Everything is energy. Money is energy. And what happens is, whatever our relationship with that energy is, whatever we’re putting in, is what we’re going to get out. So, if you are being disrespectful with money, if you have no idea how money works or what money likes … If money was a person. Can you imagine, Lisa, being in a relationship … ? Are you married? You’re married, right? Donna McCallum: 21:29 Yeah. So, if you were in a relationship with your husband and let’s say with your husband you started being really disrespectful or there were times when you were speaking badly about him. You’d always say that he was never around enough. He was never there for you when you needed him. And you would expect lots from him all the time, right? And then, at the times he wasn’t there, you would be super-emotional, super-stressed out, worried. You’d scream and shout at him when he wasn’t there. When he was there, you’d say, “How wonderful that you’re here”. But then you’d try to get rid of him as quickly as possible. How long would that relationship last? Lisa Linfield: 22:06 That’s correct. And one of the things that I was thinking about is … I read the other day that most people spend less than three hours a year learning about, or understanding, or working on their money situation. So, if I only spent three hours in a year with him, I think he’d definitely press on. Donna McCallum: 22:25 Yeah, exactly. That’s exactly the point, right? So, you only spend three hours … But you are expecting him to be a loyal, amazing partner. And when you need him, he’s got to be there for you, because he’s got to provide for you whatever you want. That’s most people’s expectations about money. That’s why money leaves. That’s why money gets the hell out of the relationship that it has with you and it goes to the people who know, “Ah, this is what I like”. And, “Ah, this is how I get respected”. And, “Ah, this is how to treat me properly”. And this is one of the reasons why wealthy people get wealthier, because they have a great relationship with money and they know how to treat money. Lisa Linfield: 23:08 I think it’s one of the things that always fascinates me is, how does one think that you can get more money if you never spend any time learning about how it works and trying to understand what it does? The amount of times I come across clients who have been investing in a retirement fund for 20 years, but it’s hardly grown at all. And I think to myself, “If you had just spent any time looking at this investment, you would have worked out that the person who’s investing it, on your behalf, isn’t growing it at all. And by now you would have 10 times the money”. I mean, literally I had a client the other day who would have had more than 10 times the money she has if she had literally just actually put it in a bank with a good interest rate. And it’s that kind of stuff. If you spend no time learning about, understanding, getting to know what’s going on with your own money, or how money works, and what it likes, and how it operates, then why would it bless you tenfold using your framework? Donna McCallum: 24:14 Absolutely. And I see this time and time again, when I start to work with people with money is, most people employ a hope strategy when it comes to money. So, I hope it’s going to get better. Somehow, if I just hope enough, more money will flow in, or somehow the money will come, or somehow I’ll get out of debt, or somehow … People are really waiting for a fairy godmother. It’s the truth. Wave their magic wand and sort out the money situation. But the truth is that you’ve got to become your own fairy godmother. You’ve got to really empower yourself to learn about money and get into great relationship with money. And I’ve seen this. I had a woman who was on my program last year and she did some feedback this year, about a month ago, and her feedback was, when she started on my program, one of the practices that I insist on is that people start to save monthly, just as a habit. And it doesn’t matter how much you save. It could be 50 rand a month. It could be 100 rand a month. It could be 500 rand, or it could be 50,000 rand a month. Doesn’t matter. But it’s just getting into that habit. And so, she started at 500 rand a month. She couldn’t see her way through more than 500. She was like, that was a stretch for her. This was a year ago. And a year later, in her savings account, she now has 36,000 rand. Donna McCallum: 25:39 Now, if you do the maths, 500 times 12 is not 36,000 rand. 500 times 12 is 6,000 rand. So, where did the other 30,000 rand come from? Well, the other 30,000 rand came from just a habit of saving, just developing the great relationship with money. Just prioritizing. Just understanding how money works and suddenly, next thing … Where she, a year before, “Oh, my goodness. The saving. And in a year’s time, it’s only going to be 6 grand. That’s ridiculous”. Suddenly it was six times that. And it’s exactly the principle that you’re talking about. If you learn about money, if you start to understand how money works, money responds and energetically comes into your life. Lisa Linfield: 26:25 It’s one of the things I spoke to a group of women on Wednesday and I challenged them that each of them were to read one blog article. And a blog article is usually three to five minutes of reading time. And that the return on the investment of reading one blog article on something to do with money for those three to five minutes, versus trolling Facebook or social media or anything for five minutes once a week. If you just invested that time, you would have read 50 articles in a year. And those 50 articles, one of them is going to make a fundamental difference. And as you increase your knowledge, there’s so much information out there that there almost is an opportunity to grow and invest in this relationship with money. Donna McCallum: 27:15 Yeah. And you’re absolutely right. We’re speaking from the same song sheet, but the problem is, right? That because the first time they ever make money, they formed a negative opinion about money, they don’t actually even want to be in the relationship with money. So, I’ll extract that for you now. The first stage of relationship building is meeting someone. And when you meet someone, you form an opinion about them immediately. And if your opinion is a positive opinion, then you start to go through the process of relationship building. But if your opinion is a negative opinion of someone that you meet for the first time, you walk away and you don’t ever want to be in relationship with that person. And that’s what happens for most people, Lisa, is that the first time they ever met money … And that’s normally at the age of four, or five, or six years old. Some people can’t remember back that far. Sometimes, for them, it’s at the age of 10, or 11, or 12, and they form a negative opinion about money. And, for that reason, they don’t actually want to get into relationship with money. Lisa Linfield: 28:20 I remember when I held my very first course on it. One of the participants, who is a fantastic human being and a great writer, she said to me, “Good luck in teaching me anything to do with maths”. And I remember thinking, “I know numbers theoretically are maths,” but for me, it had never, ever, ever occurred to me that money was maths. For me, money is behavior. Money is an everyday decision. But it just occurred to me, “How do you have a view that money equals maths?” Because for me, money is what enables you to live your dreams and it’s just a facilitator. It’s just part of what is able, you and your family to live out the lives that you want, rather than be beholding to anyone or anything. And so, as you say, somewhere there is, in her view … And she was the first of many who have said this, “Money equals maths”. Percentages and all those horrible things that those maths teachers try to teach you. Donna McCallum: 29:40 Yeah. Relationship. Donna McCallum: 29:43 And so, so often I hear, “I can’t be good with money, because of maths. I’m not good with numbers”. Or, “I’m an artist, I’m creative. I can’t be good with money”. All of these beliefs stop people. “I can’t be good with money, my Dad had businesses and then lost all his money” or … So, I’ve heard everything from, “I’m not good with numbers” to genetics to parental ancestry. Whatever. But the truth is, if you learn about anything in life and you get empowered around it, you can shift your situation. And with money you can shift it pretty quickly. Now, quick, in this day and age, is a few days. But I always say to people, if they use the tools that they get in my Money Magic program … And it’s a nine-week program. It’s a four or five hours a week for nine-week program. But by then, you’ve got the tools that you need to build your financial confidence and ultimately, financial freedom. And depending on people’s financial situations when they come into the course, if they apply the tools regularly, within five to ten years, they can become financially free. And I know that, because I’m on that path, and because a number of my students have already achieved it. And it’s just absolutely fascinating to me that people would much rather not learn it and go for the quick buck. Whether it’s the hope strategy of winning the lotto or, “Oh, my goodness. I’m going to invest in Bitcoin, because it seems that it’s exploding and everyone’s talking about it. And everyone’s making money. And I’m going to become a gazillionaire”. But before they’ve actually got the concrete foundations sorted. Lisa Linfield: 31:26 I was reading The Millionaire Next Door and they say that you have a one in four thousand chance of getting rich quick, but a three in one hundred chance of doing it the old fashioned way of hard work, which means you’re 125 times more likely to become a millionaire by the old fashioned, good, hard work. So, if those are your odds, why would you possibly take any other route? Donna McCallum: 31:52 Yeah. And I would even take the hard work out of it, because I think that a lot of people have that thought. Like, “Oh, my God. It’s going to be hard work”. I also have a lot of clients that come to me that say, “Oh, my goodness. It’s going to be so much responsibility”. And I want to tell this story from my own life. So, I am in the fortunate position … I am not yet financially free. I’m about two years away from financial freedom, but I have the fortunate position where my money, that sits in investments and property, earns more money than I do. So, that money is making more money than I do, as a salary out of my business. And my business is a lovely, successful business. And that’s a very fortunate place to be in. I’m also in the situation where, if I stopped working now and all my revenue stopped, I would be able to live for the next, probably 12 to 16 years, at the same standard of living, before my money ran out. And that gives one a huge amount of choices and a huge amount of time and security to get your next thing going. Most people have, maybe a week, if they’re lucky, worth of resource to be able to play with if their revenue stopped. But managing my money, I’ve learned about money. I’ve had an interesting time learning about money. Managing my money takes me about one hour a week, two extra hours a month, and two full days a year. That’s how much time the management of my money takes. That doesn’t include my learning about money, because I still love to learn about money, but that’s just the managing of it. And that’s not a lot of time. Donna McCallum: 33:38 So, I think that, often people have this, “Oh, hard work”. Financial freedom or becoming a millionaire, “Hard work”. No. As soon as you learn the tools and you learn the systems and you learn how money likes to be managed, then you can be putting in an hour a week, two hours a month, two days a year and having your money make more money than you do. Lisa Linfield: 33:59 Absolutely. And so, what, for you, is the definition of financial freedom? Donna McCallum: 34:05 So, for me, the definition of financial freedom is basically having an asset base that’s earning a interest above inflation, that is able to cover what my monthly expenses are, right? Although, I’ve increased my level. It’s not just my monthly expenses that I want covered. It’s my level of what I perceive revenue to be at the moment. So, my financial freedom number is 16.8 million and at an interest rate of 4% above inflation. So, my investments are earning me 4% above inflation. Once I have 16.8 million, I’m financially free. Lisa Linfield: 34:51 And for those who are listening and haven’t even started the savings plan, how do you get from not being a regular saver to creating an asset base that can look after you without you having to work? Donna McCallum: 35:06 Yeah. So, that’s the magic part of Money Magic. And this is one of the things that I say to people. The reason why my program is called Money Magic is because there’s some logical and strategy parts of it, right? But then there’s also a magic that happens with money that’s just incredible, when you get into great relationship with it. So, the first step is twofold. One is to get out of debt, because your debt is sucking your money. And the compound interest that you are paying is really sucking your money. So, the first step is to get out of debt and to also start saving, at the same time. Now, often on my program I have people going, “What? What are you talking about, get out of debt and start saving?” And this is where I kick in and say, “It doesn’t matter how much you start saving, you just get into the habit of it”. It’s actually just getting into the habit of committing to your financially freedom and committing to money that you are going to do the things that it likes. And one of the things that money loves more than anything is to make more money. And it’s very good at making more money. In fact, money is better at making money than you are. And so, let it make money. The big thing is to start getting into the saving habit. Most people, when they start by saving 100 rand a month think, “Oh, my goodness. At the end of the year I’m only going to have 1,200”. But what happens is, when you start to save, you get inspired, and you start to get motivated, and you start to feel more confidence. And you start to think, “Hey, actually I’m having this better relationship with money”. When I started saving, I only started saving 500 rand a month, because that’s what I could feel into and could afford. It’s just amazing how quickly that all shifts once you get into the regular practices. Lisa Linfield: 37:07 And what happens if you want to start on this journey, but your partner doesn’t? Donna McCallum: 37:10 Oh, such a great question. I have that all the time, because I have so many … The majority of my clients are women. I have probably about 20% of my courses on Money Magic are men, but about 80% are women. And it’s so empowering when I have couples. I had three couples on my last program and wow, it’s so empowering for them when they go through it. But sometimes women will say, “Oh, my goodness. I’m starting on this thing and my partner, he’s not even interested and how do I change him?” And the truth is, unfortunately, we can’t change anyone else. So, my advice to them always, is just to start on the path and just keep sharing with their partner. Not in a nagging way. Not in a judgemental way. But in a way that’s just really lovingly sharing some of the things that they’re learning about money. And then watch what happens. And she did that course and she did a dreams and goals course with me. And suddenly, things started to shift for her, personally. He could also see her growth and he was quite inspired about it. And at the beginning of this year, he did my Money Magic program and started to have big shifts. And then he did my Growing Wings program, which is around dreams and goals. And so, it took him three or four years to get into that inspiration, but she sent me a beautiful email about a month ago saying, “When I first started your program five years ago, we were in debt. The business wasn’t doing well. It was really struggling. This year we’ve had our best business year ever. We’ve doubled our turnover. It’s growing amazingly. We’ve got savings and investments that we’d never had before, only because we’ve just been able to put them in place. And we own our property bond free and wow”. And it’s a case, Lisa, of being the change you want to see in the world. That beautiful quote by Mahatma Gandhi. You cannot force anyone else to change, but you start being it, you start living it, you start shifting your relationship with money and things shift. Lisa Linfield: 39:46 And if you look at a person who spends time with you and has clear dreams and goals of what they want to achieve, but yet, in the reality that they’re currently in, to do what they want to do would mean that there has to be a transition period where they’re not earning money and they actually need to feed their family, how do they go about transitioning from their current reality to their new envisioned reality? Donna McCallum: 40:16 Yeah. So, often, my biggest thing, if anyone wants to take a big leap of faith, I say to them that they need to have at least three, but I highly recommend six months worth of salary saved before they take the leap. And I tell you why, because if you don’t, what happens is, you might take the leap of faith … And I’m a big believer in taking leaps of faith. I really encourage people to take massive leaps of faith. However, if you are in any financial desperation or … What happens is your power to manifest, your power to create, gets deeply diminished by your fear and your desperation that you got into. So, I don’t know if you’ve ever had … You work for yourself, right, Lisa? Donna McCallum: 41:06 Yeah. So, you work for yourself and I don’t know if you’ve ever had this experience in your own business, but you’re having a month and the month is not good. And you’re not really reaching your targets and you’re starting to get very nervous about cash flow. And you’re starting to think, “Oh, my goodness. How am I going to make ends meet this month?” And then the scarcity kicks in and a little bit of the desperation kicks in. And then the clients all disappear. Have you ever had that experience? Donna McCallum: 41:34 Yeah. So, that’s what happens, right? When you’re in any form of desperation, particularly financial, it’s one of the quickest ways of getting you into worry and anxiety and stress. Financial stress is a real dream-killer. Then you’re like, “Oh” and you get paralyzed. And also, it’s almost like your potential clients can smell the desperation and they don’t do anything. Yet, when you’re having months where you’re doing well and you’re feeling abundance and you’re feeling great and you’re feeling confidence, it suddenly seems like everyone in the world wants to do business with you, right? Donna McCallum: 42:09 And so, the big thing, if you’re going to take a leap of faith into a completely new thing, make sure that you’ve got some financial cushion. Lisa Linfield: 42:21 And then that’ll keep your confidence. Donna McCallum: 42:23 Yeah. So, I’ve got a story about that. I have a wonderful woman who did my program about two years ago, [Monita 00:42:29]. She was in deep debt when she did it. She’s pretty much almost out of debt. But she built up her savings cushion to six months worth of living expenses and then she was really ready to take a big leap of faith. And she said she’s super-ready and that’s it. And so, she did take the leap of faith. And then, she encountered so many fears and so much self-doubt in the beginning … And that can often happen, right? When we’re doing things for the first time. In my journey as a fairy godmother, the first year was filled with self-doubt. And suddenly, her money was dwindling, dwindling, dwindling. After three months she called me and said, “Oh, my goodness. I’ve only got three months’ cushion left. And I’m getting nervous and I’m in paralysis. Clients are even contacting me, but I can’t even contact them back. I’m just paralyzed by this stuff”. And I said to her, “Get a transition job. Get a bridge job”. And she said, “What do you mean?” And I said, “Get something that’s a contract for three months or six months, just to buy you some cushioning time”. And she did. And the amazing thing is that she worked there for three months on this bridge job. And then after the three months, they asked her to stay on. And she negotiated with them to give her a raise, that she was only going to work for four days instead of the five, and she got some added benefits as well. So, not only was she decreasing her amount of time she was going to work, she got a raise, and the idea is for her that, now on that extra day that she has available, she’s starting to work on her own business. And suddenly, because she’s got that financial security, what’s going on for her is her business is really starting to work. So, it’s building in some degree of cushioning for you, because reality can get really scary, and it can take you off the path quickly unless you are so, so in vision that you know that it’s all going to be okay. But that’s very unlikely. I mean, even someone like Elon Musk, when he threw all of his money at his SpaceX venture. In 2008, he couldn’t pay the rent on his apartments, and he had to go and borrow money from friends. That’s a funny place to be when you’ve been a billionaire. Lisa Linfield: 44:49 And a hard place. Donna McCallum: 44:51 Yeah. Super-hard. It starts to eat away at you. Lisa Linfield: 44:55 And I suppose, if you have both that cushioning and less financial pressure, in your example, I think that allows for more space for the creativity and the ability to hold on to your vision tighter. Donna McCallum: 45:09 Absolutely. Yeah. So, I don’t think I could have become a fairy godmother if I hadn’t had the financial resource and backing. I’d sold my previous business and because I’d sold my previous business, I had a big buffer. And then I spent a huge amount of it on being a fairy godmother, which wasn’t very clever. It was very silly, in retrospect. But we make silly decisions. Because I was so passionate about the dream that I just spent a lot of money on trying to work it out until my fairy godmothering really kicked in, after three or four years, and started making money. If you add financial pressure to already the nervousness and fear that you have about going into something new, sure, it’s a dream-killer. Lisa Linfield: 45:50 Yeah. But it’s also quite a hard, almost virtual circle, because until you have a dream strong enough to make the change, to make the behavioral change, to engage with money, to start saving it or doing something to earn more money, you need that strong vision. And in order to get the cycle going, how do you encourage people to gain the support that they need, in order to stick to this journey? Donna McCallum: 46:20 Yeah. So, one of the key things on my Money Magic program is building in support mechanisms. And so, in the program itself, the people that go through the program … And it can be a group of 100 people, 150 people go through one of the programs together. And they’re all on a Facebook group together. And so, they start to build relationships through connecting with each other there. And when I say they’re on a Facebook group, every week there are exercises to do through the program and then people feedback on the exercises. And then, what I do is I get people buddied up with somebody else. And then I also get them, towards the end, to set up mastermind groups. So, they set up groups of four or five of them where they’ll meet in a city monthly, or every two months, to keep connected. And support, you are absolutely right, Lisa, is so, so, so important on this journey. Just someone behind you to keep saying, “Go for it. Go for it”. And if there’s somebody listening here and how do you get support? Go and find somebody who is much wealthier than you, that’s in one of your social circles, who’s much wealthier than you and ask them if you can have a lunch with them or you can take them for lunch or breakfast once every two or three months to talk to them and to be able to talk to them about money. And what you’ll find is that people who have great relationships with money are very happy to talk about money and to share and to educate, because they know the issues. And also, start to connect in with more money education, more money courses, and get supported that way as well. Lisa Linfield: 47:57 Yeah. I mean, it’s for me, I think accountability partners, support, mentors, people who can keep you going are crucial, because your whole life is spent with the world telling you the opposite, “Spend, spend, spend. Now. Take it now”. Whereas, if everything you hear is in a direction which is against what you’re trying to do, it’s easy to lose energy and give up. So, the more support that you can get and the more you can surround yourself in like-minded people, the easier it is to just keep going. It’s like having a fitness trainer or fitness coach. Someone who actually, when you want to give up, says, “Hey, it’s so worth it. You must carry on”. Donna McCallum: 48:56 It’s a hundred times more. Donna McCallum: 49:02 A lot of people, afterwards, come back and go, “Oh, my goodness. I got so much value. I can’t believe that the course is so inexpensive”. But yet, when they signed up for the course, because their relationship with money was bad, they thought it was so expensive. Lisa Linfield: 49:17 Absolutely. And, I mean, it always amazes me when people will happily drop two and a half thousand rand on a plumber, an electrician, all of that kind of stuff, but they won’t invest in the thing that can give them more money. It is such an important element of your life that it’s so worth investing time, money, whatever it takes. And, most importantly, in new networks of support people, because the same people are going to tell you the same things they’ve told you your whole life, but different people will help encourage you to gain something that’s different, because they also believe it’s possible. Donna McCallum: 49:53 Yeah. Absolutely. And I see this time and time again through my money program. People suddenly get together on this Facebook group and they go, “Oh, my goodness. Thank God I’m not alone. Wow. I thought I was the only one who was dorf about money”. Because the truth is that money is the least talked about subject in our society. It is the most taboo subject. You are more likely to tell someone about a one-night stand you had last night than you are ever to tell them about how much debt you’re in, what salary you earn, what your investments are, or aren’t. And so, because money is so taboo and people don’t speak about it, often people think that they are alone. They’re the only dorf one. They’re the only one that’s really stupid, or not getting it, or bad with numbers. And everyone else is getting it, clearly, because everyone else is driving Range Rovers or BMWs and living in beautiful houses and wearing beautiful watches. So, “Wow. Hold on. I’m the only one not getting this money thing”. Lisa Linfield: 50:50 Absolutely. And the reality about it is what I always say, there’s a difference between rich and wealthy. Rich is show and tell. Everybody can see it. And wealthy is those people who have assets that earn income while they sleep. So, it’s always very, very dangerous to judge the external things and work out whether someone has wealth or not, because it could be financed by a whole bunch of debt and sleepless nights. Donna McCallum: 51:15 Yeah. One of my clients on Money Magic … And this was the biggest one that I’d seen to date … Had 839,000 rands worth of consumer debt. So, that’s store card debt and credit card debt. That’s a huge amount of consumer debt. That thing that looks very glitzy or glam in her world is debted up to the eyeballs. Lisa Linfield: 51:39 Absolutely. And that’s more than 100,000 rand every single year in interest that you’re paying on it. Donna McCallum: 51:47 Way more. Lisa Linfield: 51:47 Absolutely. So, there’s a lot you can buy with just the money that you’re paying for the bankers to sit on the beach. Donna McCallum: 51:54 Yeah. Exactly. Lisa Linfield: 51:56 So, if there are people out there who would love to go on your course or learn more about money, how would they be able to get hold of you? Donna McCallum: 52:05 Very simple. Fairygodmother.co.za. So, you can go onto the website fairygodmother.co.za. If you want to read directly about the money stuff, you can go to moneymagicprogram.com. So, all the details about the Money Magic program are on there, moneymagicprogram.com. But if you go to fairygodmother.co.za you’ll find the info there as well. And you can also find me on Facebook, Fairy Godmother Donna McCallum. And on Instagram Flowing Fairy Godmother. Lisa Linfield: 52:38 That’s great. Well, thank you so much, Donna, for your time and for your unique perspective on money. And I just hope that there are many of those out there that will feel the magic and go and take the action that it takes to become financially free. Donna McCallum: 52:54 Yeah. I thank you so much for providing this time and space to share financial education with everyone, Lisa. I so appreciate it and I know your listeners will as well. It’s always amazing. You never know what happens with these podcasts and these different things. People will suddenly come onto one of my seminars, my money seminars, or onto my program and say, “Oh, I heard about it on a podcast”. So, thank you so much for providing this space. I’m incredibly grateful. Lisa Linfield: 53:20 That was Donna McCallum and I think you’ll agree with me, some really interesting insights from a person who’s had so much experience with working with people and their money. For our episode next week, please listen next Wednesday as I share with you the one thing that has changed my life and I hope that it will change yours too. Take care and until next week, I’m Lisa Linfield and this is Working Women’s Wealth.